CD - US$ 13.99 + shipping. MP3 - US$ 11.99. Vinly - US$ 35.69 + shipping. When Daft Punk announced they were releasing a new album eight years after 2005's Human After All, fans were starved for new material. 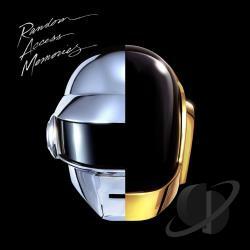 The Tron: Legacy score indulged the seminal dance duo's sci-fi fantasies but didn't offer much in the way of catchy songs, so when Random Access Memories' extensive publicity campaign featured tantalizing clips of a new single, "Get Lucky," their fan base exploded. But when the album finally arrived, that hugely hyped single was buried far down its track list, emphasizing that most of these songs are very much not like "Get Lucky" -- or a lot of the pair's previous music, at least on the surface. The album isn't much like 2010s EDM, either. Instead, Daft Punk separate themselves from most contemporary electronic music and how it's made, enlisting some of their biggest influences to help them get the sounds they needed without samples. Having first built up his considerable reputation through singles and remixes over the years and topping that off with his well-received The Last Resort album, Trentemoller took a retrospective look at things with the two-disc Trentemoller Chronicles, split between his own mix of various individual releases, including some new songs and a wide number of remixes. Given that some fans felt The Last Resort suffered from a familiar problem in techno -- less of the inventive edge of a good mix in the moment, extended explorations that went on a bit too long -- this collection serves as a good contrast of the man at his stellar best. After a few years of producing 12" EP releases on the labels Audiomatique and Poker Flat, Trentemoller made his full-length album debut with The Last Resort (2006). The album itself is a 13-track collection of new production work, much of it more ambient and atmospheric than the Danish techno DJ/producer's prior releases. Highlights include "Always Something Better," "Moan," and "Miss You." A second disc of Trentemoller's early singles is available as part of a special edition of The Last Resort. ~ Jason Birchmeier Initial pressings included bonus disc. CMJ - "It is a sweeping, immense ensemble of long, emotive tracks that seeks to span Trentemoller's career so far, cultivating a sense of all-encompassing grandeur that manifests in the album's overall intensity." 2010 two CD colleciton from South American DJ/producer Hernan Cattaneo. Entitled Day, Disc One is a beautiful, shimmering ride through Cattaneo's audio world, its musical style the perfect antithesis of Disc Two's club-inspired Night. But what's all the more remarkable is how he's also managed to work five (out of a whopping 11) original productions, remixes and edits into the mix - no mean feat considering the unique nature of the material. 31 tracks total. Audio Remixers: Sebastian Roya; Tom Szirtes; Jamie Odell. Recording information: Garden, Chicago, IL; Goldfish Studios, Cape Town, South Africa. Editor: Franck Roger. Arranger: James Kronier. Personnel: David Poole (tenor saxophone, electric bass); Dominic Peters (piano, keyboards, electric bass). Audio Mixer: Franck Roger.